Too much of seeing beautiful winter snowing scenes in the TV, our girls always ask when we can go to visit a snowy country. Our visit to Genting Snow World last November definitely did not fulfil their desire of wanting to experience the real snow atmosphere. Again, yesterday, Pearl posted this question to me on when we can go snowy place. In order to let her know what are the countries having snow, I showed her the world map for the first time. 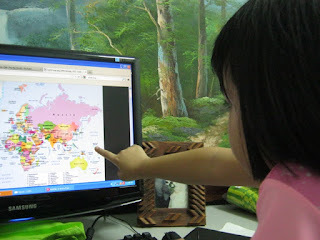 I also showed her where we live and what countries we have travelled to. Hopefully we can make a trip to a winter wonderland so that they can experience real snow this year. Hmm, playing with snow can be fun for the kids! My girls too are longing to visit snowing country. Not sure when I can make their dream comes true.